A couple of years ago some close friends of mine traveled to Cambodia, somewhat for a visit, but mostly to help provide medical attention. When they came back they had a slide show and explained all about the devastation left behind by the Khmer Rouge and Pol Pot. Appalling stuff. But what's also appalling, is my ignorance of any of it. Until their trip, I would have assumed Khmer Rouge was something found in a French Crayola box. During the 70s and 80s between 1.5 to 3 million people were killed by the brutal regime. A fraction yes, of the lives taken during WWII, but this was during my lifetime. I was ashamed to be so uninformed. So through these friends, I tried to learn more. And when I came across this book in a used book store, I thought it too, might get up to speed. 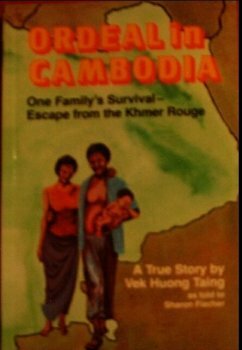 Ordeal in Cambodia is the story of one family's fight to survive during those bleak times. Simply written, it's a easy book to fly through yet it still provides a lot of food for thought (I'm a little heavy on the cliches tonight, I know). What might turn some readers off from the book, is actually a selling point for me: it's told from a Christian perspective. Those who might be turned off would probably balk at getting Christian propaganda rather than an informative text. However, as devout as Taing appears to be, he still gets the story across and even delves into some of the political reasons behind the horror. And when he does get into his beliefs, it's still compelling. There's a second story being told that intertwines with the first; how one family's faith in Jesus got them through an insanely difficult time. What makes it so compelling to me is his way of interpreting events. Some would have looked on such times as proof that God had forsaken them, or even of a nonexistence, but instead Taing held on to his belief that whatever happened was in God's plan and even if that included death, he'd welcome it because he'd be in heaven. I'm not preaching here- people can make all the guesses they want about my own personal beliefs, I ain't sharing- but I do like having a spin on a straight-forward escape story, no matter what it is. Don't feel badly, I learned most of what I know (admittedly not much) about Pol Pot from a novel, Margaret Drabble's "The Radiant Way", and it wasn't even about that. I'd be interested in reading this, from the historical perspective. I have to tell you I haven't read the book but I plan to soon. You see, I moved to Cambodia just two months ago, and yesterday I witnessed Rev. Taing Vek Huong Baptize 141 believers in the South China Sea! It was the most moving and powerful thing I have ever witnessed. This man's faith and hope for his people is a true inspiration. He has such a gentle and kind spirit about him, you would never guess the heartache and atrocities he has witnessed. Ron: What do you do in Cambodia?